I have really tested my balance and strength since starting Boot Camp. I am just so excited that I am doing exercises I did not think I could do, did not know how to do, and really challenging different muscles. Plus the support from the other participants has been so amazing. So in keeping with clean and healthy eating I decided to make a Fish Surprise for dinner. I saw some amazing fresh fish fillets at Kroger’s so I grabbed them up. They were already marinated in a beautiful Bourbon sauce. So all’s I had to do was bake them and enjoy. I used the tin foil method. Just fold in the sides and roll down to close. It’s like the bend and snap, but with tin foil! I bought three fillets they were a perfect size for me, but I worried that one was not enough for my husband, and I am so glad I did. He ate them both. I baked them on 375 degrees for 20 minutes. Then you just take out of tin foil and throw away the mess. It had a really good flavor and I will defiantly look for it again. I also roasted up some broccoli and had some leftover Mayan Harvest Bake. 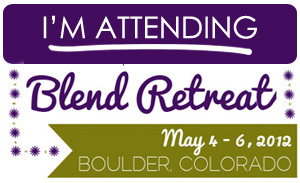 Other amazing news that I have to share with you today is this: I am attending the Blend Retreat in Boulder this May. I have been thinking about it for a few weeks and after looking into the airfare and how incredibly affordable the tickets and the lodging are I decided that I had to go, what a great opportunity to meet fellow bloggers and readers. Plus I get to take a Group Boot Camp Class with Lindsay and Tina. There is also a group hike and lots of free time to explore Boulder and get to know other attendees. I am really excited about the entire schedule. I cannot wait to find out who my roommates will be. Question of the day: Have you ever attended a Healthy Living Conference?